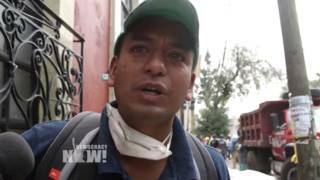 Massive Earthquake Leaves Trail of Destruction in Nepal, But Aid is Slow to Arrive | Democracy Now! editor of the Nepali Times. He recently wrote an article for The New York Times called “A View of Kathmandu After the Earthquake.” Dixit is the author of several books, including Never Again Testimonies from the Nepal Conflict, 1996-2006. Nepal’s army chief has warned the death toll from Saturday’s devastating 7.8-magnitude earthquake could reach 15,000. The toll now stands at over 6,000, with almost double that number injured. Hundreds of thousands have been left homeless. Thousands of survivors slept in tents this week rather than risk returning to damaged homes susceptible to collapsing in an aftershock. The World Food Program warns 1.4 million people require emergency food assistance, and the United Nations estimates 1.3 million children are in urgent need of humanitarian aid. The quake opened massive rifts in roads and destroyed historic structures, including the 19th century Dharahara Tower in the capital Kathmandu, which was packed with sightseers when it collapsed. We go to Kathmandu to speak with Kunda Dixit, editor of the Nepali Times. JUAN GONZÁLEZ: Nepal’s army chief has warned the death toll from Saturday’s devastating 7.8-magnitude earthquake could reach 15,000. The toll has topped 6,200, with almost double that number injured. It’s the worst natural disaster to hit the country in more than 80 years. According to the United Nations, over half a million homes and 16,000 schools have been damaged or destroyed. At least two million people will need shelter, water, food and medicine for months to come. The quake triggered avalanches on Mount Everest, where 18 climbers were killed, including three Americans. Landslides have reportedly engulfed roads and stalled arrival of aid to remote mountain hamlets in dire need of assistance. This is earthquake survivor Shim Bahkta Kattel. SHIM BAHKTA KATTEL: Our all properties are lost due to earthquake—our paddy, our animals, our clothes. All are lost, but our government is not providing any help to us. AMY GOODMAN: On Tuesday, Nepali Prime Minister Sushil Koirala announced a three-day period of national mourning. Thousands of survivors slept in tents this week rather than risk returning to damaged homes susceptible to collapsing in an aftershock. The World Food Program warns 1.4 million people require emergency food assistance, and the United Nations estimates 1.3 million children are in urgent need of humanitarian aid. The quake opened massive rifts in roads and destroyed historic structures, including the 19th century Dharahara Tower in the capital Kathmandu, which was packed with sightseers when it collapsed. The UNESCO World Heritage Site, Bhaktapur Durbar Square, and its ancient temple, Vatsala Devi Temple, was also badly damaged. AMY GOODMAN: Well, for more, we go directly to the capital of Nepal, Kathmandu, where we’re joined by the editor of the Nepali Times, Kunda Dixit. Today’s paper has four-month-old survivor Sonit Awal on its cover. Dixit recently wrote an article for The New York Times called “A View of Kathmandu After the Earthquake.” He’s been tweeting about the earthquake all week. You can go to his updates on Twitter at @KundaDixit. Kunda Dixit, welcome to Democracy Now! Talk about where you were when the earthquake hit. KUNDA DIXIT: Well, we were on a staff retreat with our reporters up on a hilltop overlooking Kathmandu. And while we were descending, all of a sudden there was this mighty jolt. It felt as if the whole mountain had moved. And we were almost thrown off our feet. And I knew it was the big earthquake that we’ve all been warning about, writing about. And my eyes turned down to the city below, and we couldn’t believe our eyes, as the whole city just was engulfed in this brown, yellow dust, as if there was a dust storm in it, and then the city just disappeared. And we really feared the worst. We thought Kathmandu had been completely destroyed. But as we got down to the city in the car about two or three hours later, we found out that it wasn’t as bad as we expected. And the news started filtering in from the rest of the country. JUAN GONZÁLEZ: And what about the situation in the rest of the country? Was the capital the worst hit, or have all the extent of the damage in other parts of the country been assessed yet? KUNDA DIXIT: Well, we had all been talking in, you know, apocalyptic terms about what Kathmandu would go through if there was a 8.0-magnitude earthquake. And the predictions were that 100,000 people would be killed, 300,000 injured, everything destroyed. Well, it turned out that Kathmandu came out relatively unscathed. It was definitely not as bad as we had feared. About 1,300 people are dead, but 80 percent of the buildings are standing. As you remarked, the historic core of the city has been destroyed, the cultural monuments. But those can be rebuilt. I think what is coming through now is that we have completely underestimated what is happening in the rest of the country—up in the mountains, in these remote villages, where settlements are scattered across the Himalayas. There are these photographs and images and videos of entire villages completely destroyed, some just wiped off the map with landslides or avalanches. And tremendous need of the people there for medicines, for shelter, for food, which, you know, I think just overwhelmed a government that is politically unstable and economically weak. AMY GOODMAN: So, talk about exactly what is happening right now in Kathmandu. UNICEF spokesperson Christophe Boulierac said up to one million children require urgent aid. This is what he said. CHRISTOPHE BOULIERAC: We think that nearly one million children are affected by the earthquake and are in need of emergency assistance. Usually in these situations, such as in Haiti in 2010, there are lots of surgery which is required for children who are maimed, who lost a part of one leg or an arm. So these are really pathologies typical that we find during situations of earthquake that needs urgent surgery. AMY GOODMAN: So, Kunda Dixit, can you respond to this, this horrific figure, 6,200 people dead and counting, and the, especially, impact on children right now? You talk about a weak government. What has to happen internally and outside Nepal? KUNDA DIXIT: I think, first of all, we need to get our logistics right. To reach these settlements, there’s just no other way except helicopters. The Nepal army has only five, only one of them a heavy lift helicopter. India has sent in six helicopters, but we need a hundred. You have to go almost house to house to take tents and medicines and food, because people live so spread out across the mountains. And that’s the first thing, logistics. And I think it’s already too late, in many cases, to get the helicopters out there. Luckily, today, we had very good weather. But for the last four or five days, it’s been thunderstorms, overcast, rain, and this has actually disrupted a lot of the flights. Hopefully, from tomorrow, the weather will get better. But we need those choppers. Secondly, I think, is coordination, coordination not just within Nepal between various government ministries and army, police, and all that, but also coordinating the interface between the foreign aid coming in and the delivery out to where it’s needed the most. There are flights with—relief flights from India, China, Europe, America, Australia, all flying in. The airport is jam-packed. It’s congested. Even the relief material has to wait for hours and sometimes days to get unloaded off planes. So it’s a bottleneck here in Kathmandu, but then the material that they have brought is needed very, very urgently. JUAN GONZÁLEZ: Now, I wanted to ask you—you mentioned helicopters, that India has sent in six, but you have major nations around you, near you, that have huge armies that obviously would have the kind of equipment you need. And what’s been the response from China, India and, as you said, Australia? KUNDA DIXIT: Well, the response from India was very prompt. It was within—within seven and eight hours, they had already got their first jets in, because they have air force bases right across the border from us. The very next morning, the six helicopters arrived. So it was extremely prompt. And the helicopters were immediately deployed up in the mountains. China has also sent in now—by now, about 12 very large aircraft with relief material, with their rapid response teams, with their rescue teams, with search dogs. They have a lot of experience from Sichuan earthquake. So, these—this means that the people are out there digging through the rubble, trying to get out. But very soon now, in a few days, it will turn from search and rescue to relief delivery. In fact, the relief should have gone hand in hand, but somehow it has taken some time. It has been a slow start. AMY GOODMAN: You wrote, Kunda Dixit, four months ago, before, of course, this earthquake struck, in January—the Nepali Times published an editorial titled “Unnatural Disaster: Earthquakes Don’t Kill People, Weak Houses and Bad Planning Do.” What was the unnatural disaster here? KUNDA DIXIT: Well, we should be used to earthquakes, you know, like the Japanese are used to earthquakes. This is a highly seismic zone. These mountains are still rising. The Indian Plate is still pushing against the Eurasian Plate. And earthquakes happen here once every 80 years. It’s documented. Kathmandu is actually destroyed every 80 or 100 years. So, we should actually be very prepared for this, and we weren’t, especially as Nepal opened up to the outside world and to globalization, as new buildings were built. These are not very well designed. And I think there we really—this was a real warning that—at least to Kathmandu, that next time, when the big one strikes, we’ll have a major disaster in our hands, not just 1,300, 1,400 killed, but hundreds of thousands. But this time we actually got, despite the very high death toll, even in the mountains, we—the death toll was lower than it could have been, mainly because it was Saturday. It was just before noon. A lot of farmers were out planting crops, getting ready for the maize season. The children were not in school. And as we heard before, 1,500 schools were destroyed. Imagine if those classrooms had been full of children, if it was any other day. Luckily, it was a weekend. So, I mean, it could have been much, much worse than what we witnessed. JUAN GONZÁLEZ: Kunda Dixit, your country is listed as one of the least developed countries in the world, with a huge, also, foreign debt. What’s your hope or expectation in terms of international bodies in this time of crisis for helping the country get out of its immediate calamity? KUNDA DIXIT: Well, I think foreign help has been so prompt and so overwhelming, that I think it really is a testament to the tremendous goodwill Nepal has internationally, you know, between its two neighbors, India and China, as well as Europe and the rest of the world. I think the indebtedness is a problem. I think one way to start would be to reschedule or forgive a lot of this debt, so that we can get a head start on rebuilding. There’s going to be a tremendous amount of resources needed for the reconstruction, for getting people back on their feet. Agriculture is going to be undermined. The monsoon planting, rice planting season is coming up. A lot of people have lost their seeds. A lot of people have lost homes. The prime minister has announced that every family will be entitled to $1,000 for a fatality. That’s going to be peanuts, because there’s just so much that families have to do to catch up and start being able to feed themselves again. And remember that a lot of these people who and families who are affected were subsistence farmers. They really don’t have any savings or storage of food. They really need immediate help in terms of food, shelter and medicine. AMY GOODMAN: What can people outside the country do to help the people of Nepal right now? Again, the overall figure we’re hearing is 6,200 dead in Nepal and counting, the figure rising dramatically, over 8,000 people injured. KUNDA DIXIT: Yeah, well, I think the immediate help has already come. I think we have got as much as we can handle for now. But I think what’s much more important is help in the medium and longer term. In the medium term, it means sustained help for food and for shelter. So we’re not just talking tents now. The monsoon season is coming. It’s going to start raining. Maybe prefab houses, more sturdier tents, and then maybe credit for families to rebuild their houses and to start planting their crops. For this, Nepal is not really poor; it’s just sometimes poorly managed. So, there is money here. A lot of our budget is unspent. It just has to be spent wisely. And whatever shortfall there is, we can always ask for help, and I’m sure it will be forthcoming from the international community. AMY GOODMAN: And finally, the politics internally in Nepal right now, if you could give people a sense what the Nepalese government has been dealing with? I know there’s one, what, big helicopter in the Nepali army. But aside from that, the politics, the internal warfare that’s been going on? KUNDA DIXIT: Yeah, well, a lot of your viewers may know that we’ve just come out of a 10-year conflict. It ended in 2006. It’s been eight years. We’ve been trying to write a new constitution, to get the politics moving again, but it’s been stuck because of a dispute over what kind of federalism we should have in the new constitution. And a lot of politicking there, a lot of clashes between various political parties, and the constitution-making process has been stuck now for eight years. So, we need to get over that and move ahead. Hopefully this crisis will be a catharsis so that it will shake us up and allow us to at least find a compromise solution on the constitution. We need that desperately, because without political stability, we will not have the kind of economic growth that can sustain us in the longer term, to create jobs, to have health and education, to have adequate food for everyone. So I think fixing the politics is really one of the other priorities that has to happen side by side with all the relief and the long-term rehab that needs to go. AMY GOODMAN: How has the Maoist opposition responded to this disaster, this catastrophic event that’s taken place, the earthquake? KUNDA DIXIT: Well, actually, it looks like all the politicians have gone into hiding. In fact, there’s a joke on Facebook, which has eight of our top political leaders, and the caption underneath it says, “Missing since the earthquake. Finders, please let us know.” So these are our top political figures. And really, they haven’t really made an appearance. They seem to be really scared that the people blame them for not providing enough adequate relief and help, and for dragging the political instability for so long, which has led to this—led to the slow response to the crisis. AMY GOODMAN: Thank you so much. According to The Wall Street Journal, Nepal—the spokesperson for Nepal’s Maoists, Dina Nath Sharma, castigated the Nepali prime minister for moving too slowly to help people affected by the quake and for showing insensitive attitude at this time of great national loss. Kunda Dixit, we thank you so much for being with us, editor of the Nepali Times, speaking to us from Kathmandu, recently wrote a piece for The New York Times called “A View of Kathmandu After the Earthquake.” He is the author of several books, including Never Again Testimonies from the Nepal Conflict, 1996-2006. You can follow him on Twitter at @KundaDixit. This is Democracy Now! We’ll be back in a minute, talking about Baltimore. Stay with us.